As we reported earlier, Android Wear 2.0 is all set to go official tomorrow. The first two smartwatches to come running with the latest Android Wear version are LG Watch Style and Watch Sport. Just a day before the official unveiling of the Android Wear 2.0, a new leak has made its way to Twitter, courtesy – @evleaks. Usually considered as a reliable leak source, @eveleaks has tweeted that both the new smartwatches will be announced today, not tomorrow. Even though Google has not revealed any information yet but we could expect some news today. The first look of the upcoming Android Wear 2.0 has already hinted on the arrival of Android Pay payment service on the wearables. There are also plenty of images of Android Wear 2.0 interface available on the internet. The screenshots available on Google Play’s Android Pay page conveniently shows how Android Pay looks on a smartwatch face and how it works on terminals. 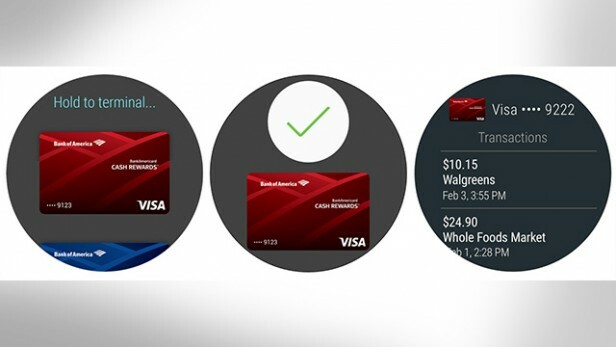 The process for paying via Android Pay on smartwatch seems pretty easy; you just have to open the app on the watch, select the debit/credit card for payment, and hold the watch up for completing the transaction at the payment terminal. After the payment completion, the app will show the full list of payments made. Users will be able to scroll through the list and check the payment history. In order to take advantage of this new feature on Android Pay 2.0, your smartwatch must have NFC (Near Field Communication) connectivity that is not available on any smartwatches that are retailing currently. It could mean that the LG’s upcoming smartwatches will have NFC connectivity onboard. LG and Google worked together for Watch Style and Watch Sport. To recall, Android Pay for smartphones had been a nifty feature for users, and it has been long awaited to debut on Android Wear too. Now that it is finally making its way to smartwatches, it would be interesting to see how it help LG’s new smartwatches in becoming a primary choice among smartwatch aficionados. What’s your take on Android Pay’s inclusion in Android Wear 2.0? Share your views in the comment section below.